An effort to bring back the original series. The books that were published and the books that were not published. 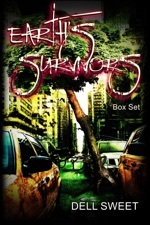 Book One: The Original Survivors: From Ashes. Candace March 2nd: This is not a diary. I have never kept a diary. They say, never say never, but I doubt I will. I have never been this scared. The whole world is messed up. Is it ending? I don’t know, but it seems like it’s ending here. Earthquakes, explosions. I’ve seen no Police, Fire or emergency people all day. It’s nearly night. I think that’s a bad sign. I have the Nine Millimeter that used to be my Father’s. I’ve got extra ammo too. I’m staying inside. Candace March 3rd: I lost this yesterday; my little notebook. I left it by the window so I could see to write, but I swear it wasn’t there when I went to get it; then I found it again later on by the window right where I left it. Maybe I’m losing it. There are no Police, no Firemen, phones, electric. The real world is falling apart. Two days and nothing that I thought I knew is still here. Do you see? The whole world has changed. I got my guitar out and played it today. I played for almost three hours. I played my stuff. I played some blues. Usually blues will bring me out of blues, but it didn’t work. It sounded so loud, so out of place, so… I don’t know. I just stopped and put it away. Candace March 4th: I’m going out. I have to see, if I don’t come back. Well… What good is writing this? Candace March 5th: The whole city has fallen apart. I spent most of yesterday trying to see how bad this is. I finally realized it’s bad beyond my being able to fix it. It’s bad as in there is no authority. It’s bad as in there is no Jimmy V. I hear gunshots at night, all night. And screams. There are still tremors. If I had to guess, I would say it’s the end of the civilized world, unless things are better somewhere else. I have to believe that. Power, structure, it’s all gone. I mean it’s really all gone. This city is torn up. There are huge areas that are ruined. Gulleys, ravines, missing streets, damaged bridges. The damage costs have to be in the billions… And that’s just here. There’s me and my little notebook I’m writing in, and my nine millimeter. I’ve got nothing else for company right now. I’ve got water, some peanuts and crackers. How long can this go on? What then? Candace March 6th: I’ve decided to leave. I can’t stay here. There was a tremor last night, and not one of the really bad ones, but even so I was sure the house would come down on me. It didn’t. Maybe though, that is a sign, I told myself. And scared or not, I have to go. I have to. I can’t stay here. Maybe tomorrow. Candace March 7th: The streets are a mess. I’ve spent too much of the last week hiding inside my apartment. Most of my friends, and that’s a joke, I didn’t have anyone I could actually call a friend. I believed someone would show up and tell me what to do. But no one did. I saw a few people wander by yesterday, probably looking for other people, but I stayed inside. I don’t know why, what all my reasons were. A lot of fear; I think. There have been earthquakes. The house is damaged. I went outside today and really looked at it. It is off the foundation and leaning. I should have gotten out of it the other night when I knew it was bad. It’s just dumb luck it hasn’t fallen in on me and killed me. It doesn’t matter now though. I met a few others today, and I’m leaving with them. I don’t know if I’ll stay with them. I really don’t know what to expect from life anymore. I’m taking this and my gun with me. Writing this made me feel alive. I don’t know how better to say it. I’ll write more here, I think. I just don’t know when; or where I’ll be. Book Two: The Original Survivors: On The Road. He had been going up the hill? Going down the hill? He couldn’t remember. The… the attack had come. The attack had come and he was… must have been wounded… gravely wounded. And if he didn’t breathe soon, it would turn into something even worse. He had to breathe. He had to breathe soon or… She stepped into his line of sight. The bones in her face were close to the surface, pushing at the taut skin there. Her skin was greenish-gray, or maybe it was a trick of the moonlight. Her silvered eyes held his own. Her long black hair was a tangled ruin. The skin of the rest of her body was pale white: Unbelievably white. So white, translucent, that he could see the spidery trails of purple-blue capillaries, veins rising and touching the surface of her skin and then plunging deep into her body, under the skin and muscle… pulsing… seeming to be alive, although she seemed as dead as anything dead that he had ever seen. As a kid, he had happened into a vacant lot one morning on the way to school. He had seen something over in the weeds that ran along the fence line of the lot next door. There he had looked down upon the body of a bum who had either died during one of the recent cold nights or had been murdered and dumped there. His face had looked like this one before him. Gray, too pale, the bone structure too close to the surface: The skin looking more like wax than skin. Just like this… this… whatever this was. Jeff sank back down to the ground on his knees: The cold moonlight shone down, the others still silent and standing around him. Book Three: The Original Survivors: Alabama Island. They had just passed a large mansion, or what had once been a large mansion on East avenue: Nearly into downtown when the attack had come. The last Jeep, Ed… Terry, Gina? He couldn’t remember for sure, but it didn’t matter, they were only the first to go. The Jeep had blown up behind them. One second it was morning silent; birds whistling from the tree lined street, and the next a roaring fireball had erupted from the Jeep. The Jeep had lifted into the air engulfed with flame, and had come back down a split second later a twisted, shattered wreck. The roof ripped open crudely as if a giant can opener had done the job: Glass gone, body twisted: Blackened shapes, still moving, clearly seen through the flames. They had all panicked. Joel had hit the brakes, somehow convinced they had driven over something in the road: Landmines. The word leapt into his mind and kept repeating. The second Jeep had rammed into them, Scott, Lilly, Jan, and that had distracted him further. As he had lifted his eyes he had seen the men squatting beside the once elegant mansion. A rocket launcher on one man’s shoulder, and he had known the truth. He had come to hours later; the vehicles’ nothing but twisted husks, still burning in the black night. He could feel the heat from the fires. He had lain for what seemed like a long time trying to orient himself, make sense of what he last remembered, and what he now saw. Time did nothing to sort it out. It still made no sense some time later when he had first tried to sit up. Pain had flared everywhere and the black curtain had descended once more.